Coming up with fresh new ideas isn’t always so easy. There are times even the typical brainstorming techniques with your team would hit a roadblock. That’s when you should try something new. Maybe go about brainstorming ideas in a whole new way. We’ve got 7 effective brainstorming methods you can use to quickly brainstorm and generate ideas through drawing, writing and diagramming. Mind maps are a tool used to visualize and organize information. Capturing your free flow of ideas using a mind map during brainstorming will help you quickly make sense of the relationships between the information you come up with. They are also a great way to break down an idea and analyze it. Need to know how to use a mind map for visual problem-solving? Get more mind map templates. In reverse brainstorming, instead of finding solutions to a problem, you wonder how to cause it or how to achieve the opposite result of what you expect. Fishbone diagrams, which is typically used to find the causes of an effect (hence named cause and effect diagram), can be used to facilitate a reverse brainstorming session. 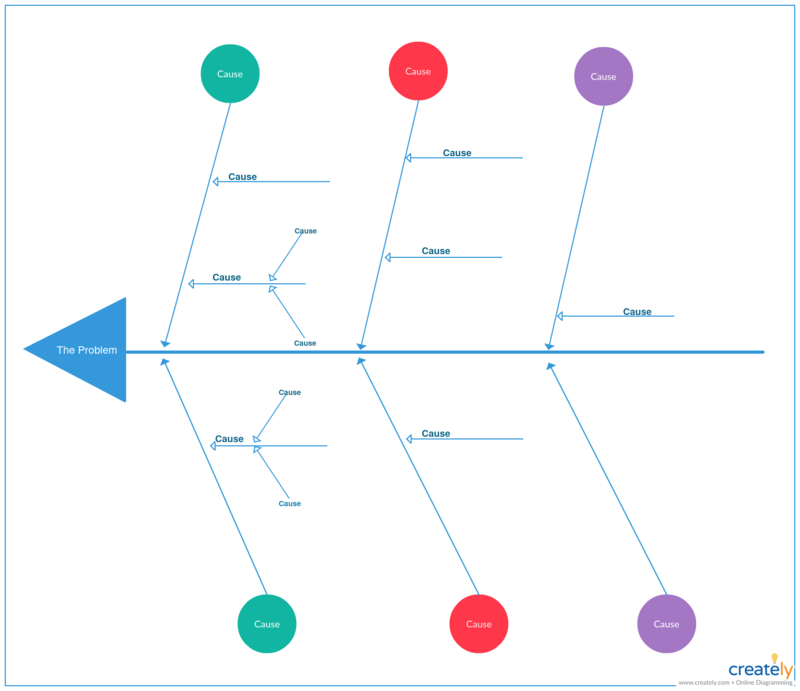 Want to learn more about fishbone diagrams? Here’s a useful guide on fishbone diagrams explaining everything from how to draw one to free templates you can quickly edit. Get more fishbone diagram templates. Gap filling is basically about finding where point A (i.e. current situation of your business) is and figuring out the steps you need to take to get to point B (i.e. business goals you want to achieve). You can use a method like flowcharts that maps process steps, to easily carry out a gap filling brainstorming exercise. Following is a free flowchart template you can use to start with. 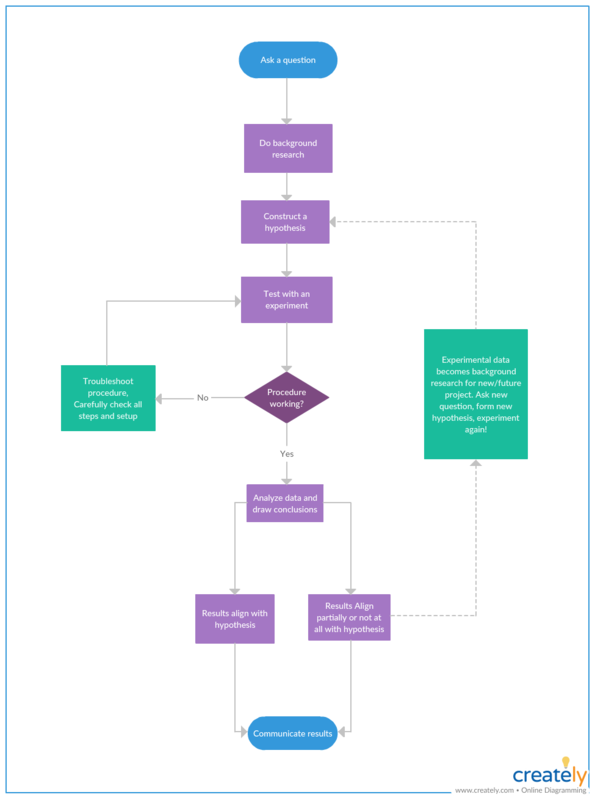 Learn more about flowcharts and how to draw one with this flowchart tutorial. SWOT analysis is a summary tool that lets you analyze the internal (Strengths and Weaknesses) and external (Opportunities and Threats) factors of your business. If you are creating a new business plan or simply planning ahead, you can use a SWOT analysis to identify where you stand as a business. Not entirely sure how to incorporate a SWOT in your brainstorming session? Here’s how to use a SWOT analysis effectively. Plus, if you are doing a competitor analysis before making your move, you can also do a SWOT analysis for each of them. It’ll make it easy for your team to decide what steps should be taken and how to avoid the barriers ahead. 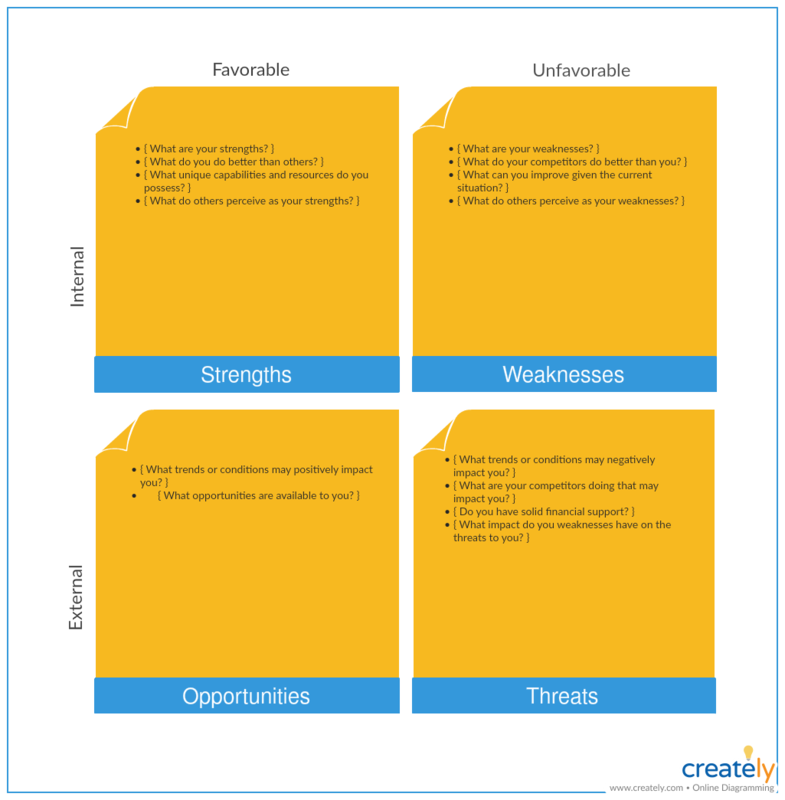 Get more SWOT analysis templates. 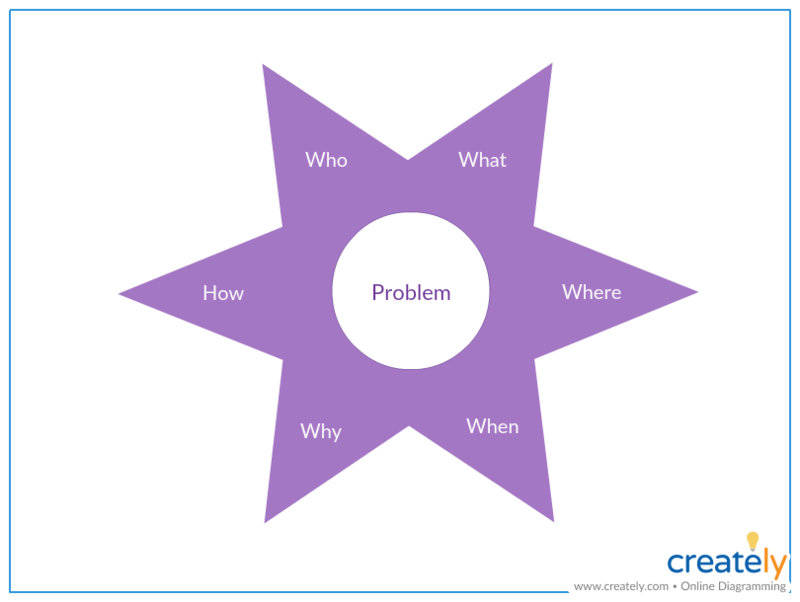 Instead of directly discussing solutions, starbursting gets you and your team to examine the problem first by asking not just the 6 key question, but also several other questions as necessary. At the end of the session, your team will not only have figured out the solutions to the issue but will also have a clear vision of the next set of steps that you need to take. Brainstorming around a topic generates a flood of information. At times it can be difficult to review or make sense of any trends the data may indicate. Affinity diagrams allow you to neatly arrange and group ideas so that it would be easy to read and analyze. Get your team to sort the ideas/data into groups based on similarities etc. 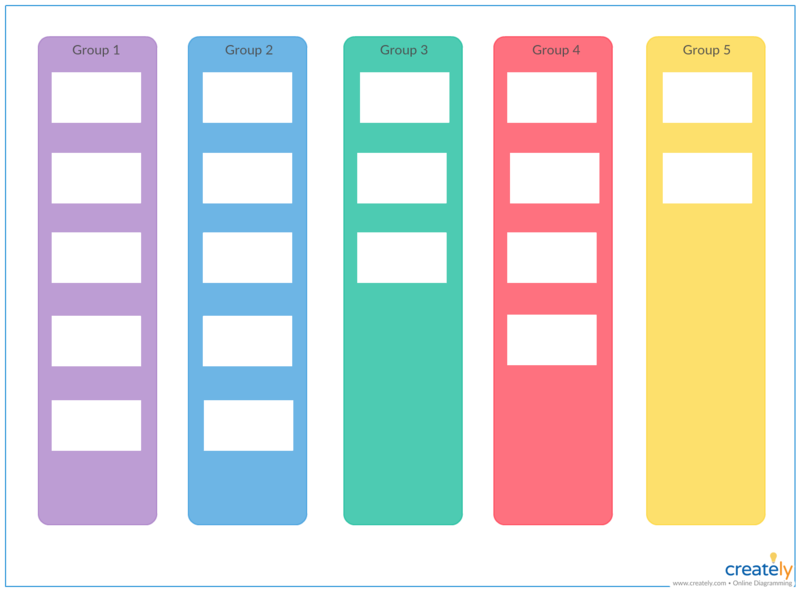 Here’s an affinity diagram template that you can use to organize the information neatly. Click it to add data you’ve collected. 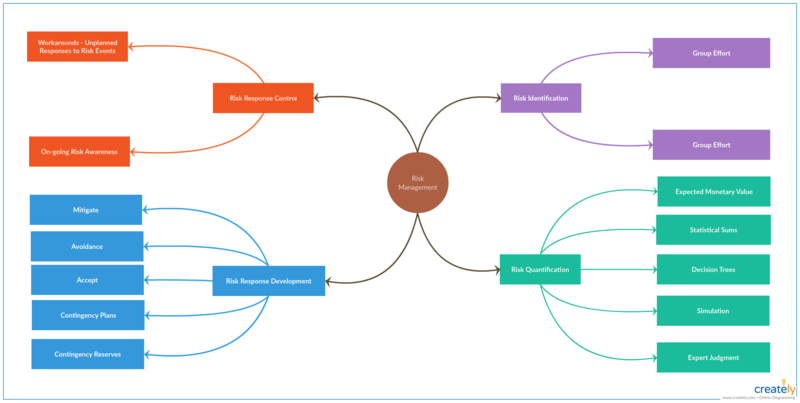 Concept maps are a learning and teaching technique that is used to identify the relationships between ideas or concepts. They help properly structure thoughts that are thrown around in a brainstorming session in a way that is easier to understand. 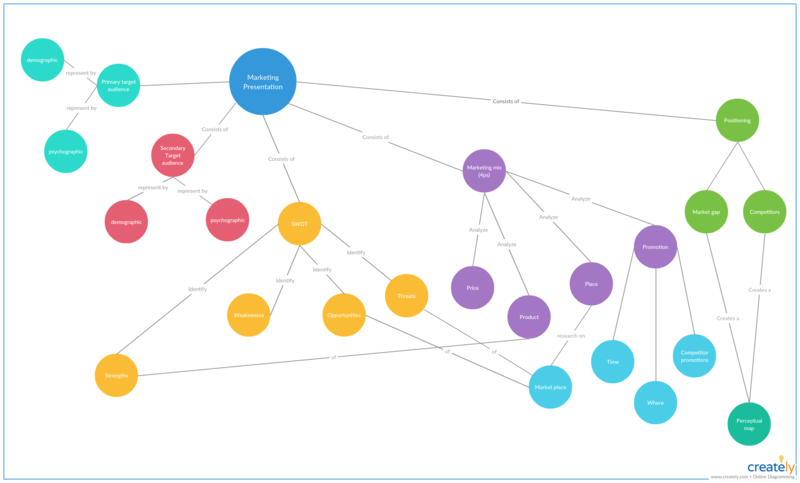 We’ve got a handy concept map tutorial to help you learn the technique in-depth. And if you are already familiar with concept mapping, use this free concept map template to run your next brainstorming session. What Other Visual Brainstorming Techniques Do You Use? We’ve listed 7 visual brainstorming techniques that you can use to boost generating ideas with your team. If you have any other brainstorming technique that is your favorite way of coming up with new ideas, share them with us. My personal favourite is a flowchart. Probably because I’m most comfortable with using it, that’s the first one that comes to my mind when I need to brainstorm.